Collapsible Drinking Cup – 9oz / 270ml. The ultimate in convenience! This 9oz. 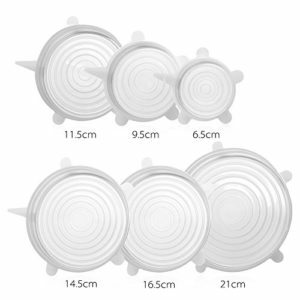 cup shrinks from an open size of 9cm down to tiny 1.5cm when closed. 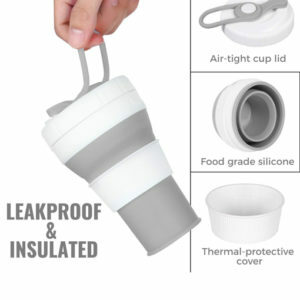 Fabric handle can attach to the cup to ensure the two pieces stay together in your pocket or bag. 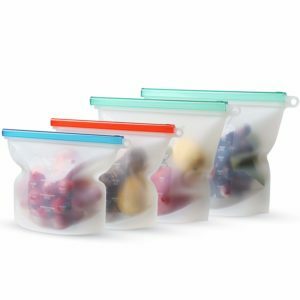 Characteristics – Our collapsible travel cup made of 100% food-grade silicone material, flexible and easy to clean, and FDA approved. Collapsible – This travel cup with collapsible design is the ultimate space saving design. 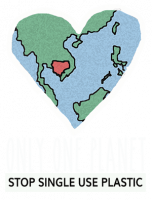 Great for hiking, camping, picnic, business trip, outdoor sports. Can also be used to water your pet on a hot day out in the sun. Heat Resistance & Durable – Withstands a temperature range of -40 degree F to 480 degree F. Suitable for cold drinks, tea, coffee and other cold & hot beverages. Great thermal stability, insoluble in water and any solvents. Dishwasher & freezer safe. POCKET SIZE & EASY TO CARRY: Collapsible design, tiny size for space saving. Lightweight. Very conveniently p laced in the suitcase, backpack. Do not occupy space. When you’re not drinking, it collapses into a compact, liquid-tight disk, saving you space in your backpack, handbag, briefcase or jacket pocket. UNIQUE DESIGN: The collapsible cups mainly consists of three parts. The lid fits neatly and keeps the cup clean and hygienic and the metal rim makes the mug much easier to hold and drink from. It stabilizes the cup and keeps it in shape. No accidental overflowing or splashing of drinks if the cup is gripped a bit too tightly. The square base makes it secure without danger of tipping over. 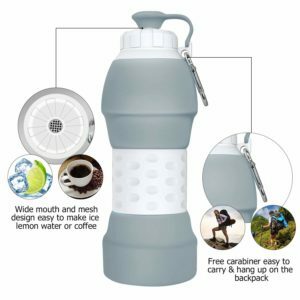 Collapsible Silicone Coffee Mug – 450ml / 16oz.